Some municipalities show positive signs of growth, but a closer look at the statistics may reveal another story. This first comparative study on a grid level (1,000 x 1,000m) between 2008-2017 in the Nordic Region shows population changes that are not easy to detect in the statistics. For instance, the study identified several municipalities where the total population is growing, but where the inhabited land area is shrinking, suggesting that centralization and urbanization towards the municipality centers occur. Nordregio’s new study Population Change Dynamics in Nordic Municipalities found mismatch in some statistically growing municipalities with a total population increase, but where a large proportion of the geographical area (a high number of grid cells) has, in fact, decreased in population. Volda and Flora (NO), Vänersborg and Katrineholm (SE), Kokkola and Joensuu (FI), and Kolding and Holstebro (DK) are examples of this type of municipalities. Some municipalities show little change in the total population, but considerable population changes at the grid level, especially in Esbjerg and Haderslev (DK), Kvinnherad (NO), Pori and Tornio (FI), Söderhamn and Säffle (SE). For instance, Pori is an interesting case since the population in the municipality has remained nearly the same, but when zooming in at grid level, you can detect a lot of movement: the most densely populated urban centre has grown even more, leaving the surrounding areas with declining population. So, the population in Pori has strongly centralized in ten years, which does not show in the municipality level comparisons. Some shrinking municipalities, like Kramfors (SE), Äänekoski (FI), Lyngen (NO), and Lolland (DK) appear as shrinking in the statistics, but at the grid level they have a significant amount of growing areas. In Äänekoski, these growing areas are outside of the municipality center, so people are moving from the center to the suburbs. The Nordic comparison shows that Sweden and Norway have more consistent population development patterns at both grid level and municipality level. In Norway, this might reflect the active regional policies and national support mechanisms. In Sweden, on the other hand, this might reflect urbanization that started decades earlier than e.g. in Finland. 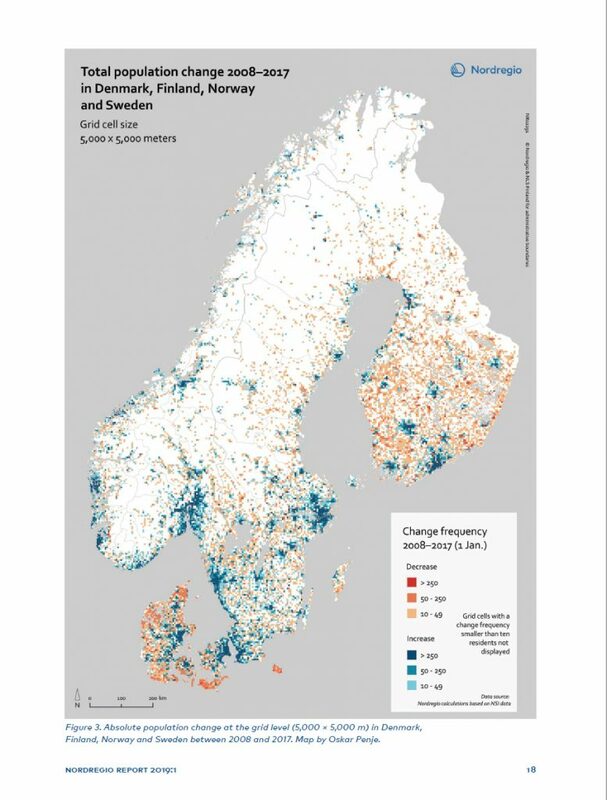 In other words, the population change has more likely already happened earlier in the Swedish rural areas and does not show radical statistical shrinking from the past ten years. Finland still has a higher percentage of sparsely populated rural areas than Sweden and Norway. The general trend of urbanization is shown throughout the Nordic Region. Edition 2 has been published: Correction to Table 9 has been made. In Edition 1 Shrinking (n) and Growing (n) headlines under Grid Cell Behavior were misplaced on wrong columns.